【オールナイト！】The regular meeting in Osaka is successfully over!! I've gotta stick to my study plan! I was half asleep, but tried 30 MCQs from GLEIM-FAR. I took a day off today! And, I happened to have received two questions regarding FAR from a friend of mine today. So I tried my explanation below. Forgive me to put it in English, because, I think & type faster in English as is the case with many of you. Before you read the following report, please be noted that I didn't refer to any particular textbook or anything. Besides, I haven't passed FAR, not to mention AUD, REG, and BEC. So the following trial explanation of mine could be wrong. Please verify by yourself whether or not I'm wrong. Sorry. It’s hard and troublesome to understand FACTORING. Especially I cannot distinguish between FACTORING and PLEDGE (ASSIGNMENT). Do I have to just memorize the journal entry for these transactions? And next about CASH FLOW. Why do they categorize DIVIDENDS PAID as FINANCING ACTIVITY, while DIVIDENDS RECEIVED are categorized as OPERATING ACTIVITY? It’s confusing if you try to learn FACTORING & ASSIGNMENT together just because they are both related to A/R. Please understand them in a totally different context. First, let’s talk about assignment. This is very simple. ASSIGNMENT is an action to collateralize the existing (and sometimes prospective) A/R for LOAN. The loan secured by this action could be in the balance of N/P; the loan that was made earlier and still remains. In this case, there’s no particular journal entry to be made. Only required is some disclosure treatment: A/R assigned should be disclosed parenthetically or the notes to the F/S should be made. But there could be another case: the loan secured by A/R assignment could be an "additional" amount of loan which is made on the condition that some A/R is assigned for the loan. In this case, you have to credit N/P and debit Cash for the loan proceeds. But remember that this journal entry for N/P is nothing special!! You always do this journal entry whenever you borrow money! The above entry is made when you sold your A/R without recourse liability. But, at times, the buyer (= factor) wants to avoid the risk of uncollectibility. In such a case, the factor demands you to sell you A/R with recourse, which means you are obliged to buy back the A/R from the factor when the factor fails to collect the A/R by itself. If you sold your A/R on such an unfavorable condition, you have to accrue the LIABILITY for that for fair presentation. That’s all for Question #1. Again, the point is that ASSIGNMENT is not anything special. ASSIGNMENT refers to a situation, in which a company borrowed some money from a bank, and the bank required some collateral for the loan, and A/R happened to be collateral instead of its office building, its factory, its investment securities, or any other properties that could have possibly been collateral for the loan. I recommend you to first check out my report about CF which I wrote May 27. 2006, because I explain the general explanation about how to understand the three types of CF classifications without confusion. After you read the above report of mine, I hope you’ll find today’s your question #2 very analogous. The point I noted in the above report is that there’re two different perspectives: Borrower’s (Investee’s) perspective & Lender’s (Investor’s) perspective. DIVIDEND PAID is a cost which is incidental on financing a certain amount of money, which is obviously FINANCING ACTIVITY. DIVIDEND RECEIVED is, on the other hand, a regular cash inflow, which is similar to bank deposit interest. It’s collected and recorded as other revenue in the income statement. The collection is often made on annual basis, which goes along with most companies operating cycle. So, from investor’s perspective DIVIDEND RECEIVED is quite similar to INTEREST RECDEIVED, the cash inflow of which is also categorized as OPERATING ACTIVITY. Well, that’s all about it. I really appreciate it if you were patient enough to read till here! If you have any further or related question, please ask me. I’ll answer either in English or in Japanese as you specify. 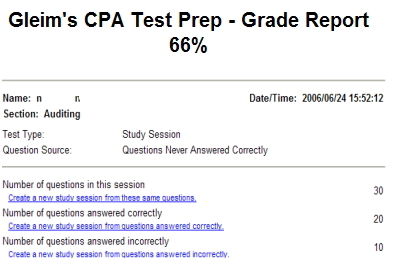 But, again, please be noted that I haven’t passed any of USCPA exam subjects yet. My understanding and explanation here on my blog could be wrong, so please verify nn’s report by yourself! Thank you. I'll be up all night tonight! I went to bed 10:30 last night, so I slept for about two and a half hours last night. Sleeping hours at night is getting shorter day by day. But, unfortunately, I’m not a man of strong mind. So, I’m half asleep during the daytime, compensating the short sleep at night. I sometimes notice I’m asleep on the bike. And, this morning, I was almost collapsing to fall down from the top of the stairway in the station. I’ve gotta be very careful not to trouble other people. I shall NEVER bother people due to my personal problem. I’m preparing for RESEARCH question by using some searching site these days. U.S. Tax Code On-Line is the one for REG. I knew about this because a guy on the CPA-NET FORUM kindly introduced this website to me. AICPA Resources is for FAR and AUD. This is very useful as well, and I learned about this from people I met here on my blog and the regular off-line meeting (定例会). So I’m really helped a lot by people I came across on the internet world. Unfortunately, today I got assigned so many projects at once. All are due on July 31… What a BAD timing! It’s Saturday today. So I’m off duty today, but came to the office; not to work, but to study. I have almost no days remaining before the exam. 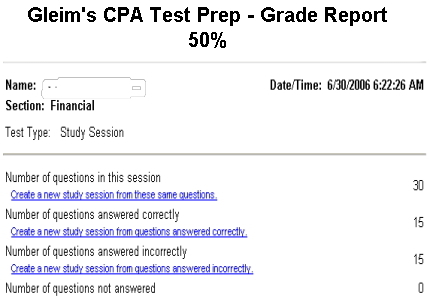 The required accuracy for each subject of USCPA exam is 75% or higher, while the average score that I earn on the practice material is 60%. I’m hopeless. But there’s nothing that I can do now. All I can do is to do my best to catch up with my study plan, without wasting even a single minute. AUD is the subject I think I’ve been working harder than the other three subjects, and yet my score is so…. TERRIBLE! I’m relatively weak with GAGAS, Generally Accepted Governmental Accounting Standards, promulgated by GAO, General Accounting Office. I wish I could suddenly disguise into a new strong super-man like Batman! … of course, I know better than to wish a fairy tale comes true. I know I should just study, study, and study --- so as not to regret over my negligence in 30 days.